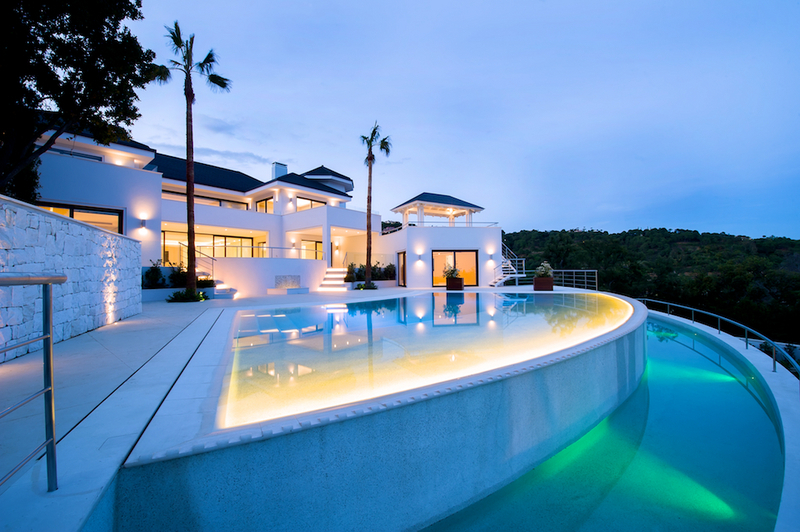 Truly unique architect-designed contemporary home with breathtaking panoramic views over Marbella and the Mediterranean to Gibraltar and the African coast. Built on 3 floors the mansion boasts 2,320 sqm of luxuriously-appointed living space and 300 sqm of covered and open terraces on an elevated level plot of 5,000 sqm. The interior design flows seamlessly out onto spacious terraces around its outdoor swimming pool, lounge area with Jacuzzi and chill-out bar. Two-storey main entrance hallway featuring a twin staircase and a lift serving all three floors, opening on to the marvelous views and leads directly into a palatial living room with full-width glass wall. There is a further smaller sitting room with feature fireplace and a dining room leading into the 55 m2 state-of-the-art island kitchen with sitting area. The enormous lower level is the entertainment hub with facilities that rival health clubs with 75 m2 of gym area, with exercise floor, bar, lounge area looking, heated indoor infinity pool with Jacuzzi, sauna and steam room. Two self-contained apartments for guests or staff with separate entrance. Two guest bedrooms, each with their own bathroom and a guest cloakroom. From the landing double doors open into the master bedroom suite boasting possibly the best view in the whole house through its floor to ceiling windows. With plenty of space for a sitting area, it has a fireplace wall, large walk-in wardrobe and luxurious bathroom with bath, shower and twin sinks. There are two additional bedroom suites, both with dressing areas and private bathrooms. All surrounded by very spacious semi-covered terrace areas and feature full-height glazing. Finished: June 2016. Please, send me more information about ref W-0256X5, Villa in La Zagaleta, Benahavis or similar properties.